This is the fourth piece of DLC released to date for Call of Duty: Advanced Warfare, featuring four new maps, plus the return of the Exo Grapple playlist and the conclusion to Exo Zombies. Quarantine: This medium sized map takes place on an island following a deadline outbreak that features both tight corners and open areas that combine to allow for any style of gameplay. In the atrium, every step is precious as the floor opens up, in a timed dynamic event, to reveal a bottomless disposal pit. Fracture: Locked away in the arctic, players take refuge behind wind turbines and heavy equipment that allow for large combat. As the ice buckles and breaks away, flooding escape routes, long-site lines are more key. Swarm: Narrow corridors of this small to medium sized map in Seoul, South Korea, are the setting. Close quarter store interiors tell the story of a war scarred city that has flanking routes and cover all around. Reckoning also brings with it Descent, a new experience introducing a remote ocean Atlas survival facility, new “fused” exo zombie enemies, and the Trident Reflected Energy Weapon. In the dramatic conclusion of the Exo Zombies saga, Descent continues where Carrier left off. Following the discovery that one of their own (John Malkovich) is now among the undead, the squad (Bill Paxton, Rose McGowan, Jon Bernthal, and Bruce Campbell) find themselves in a difficult situation as they attempt to discover the true cause of the global pandemic and the terrible secret that Atlas has been hiding. Call of Duty: Advanced Warfare Reckoning is priced at $19.95 SRP in AUstralia, and is also available as part of the Call of Duty: Advanced Warfare Season Pass along with the first three DLC packs for a discounted price. 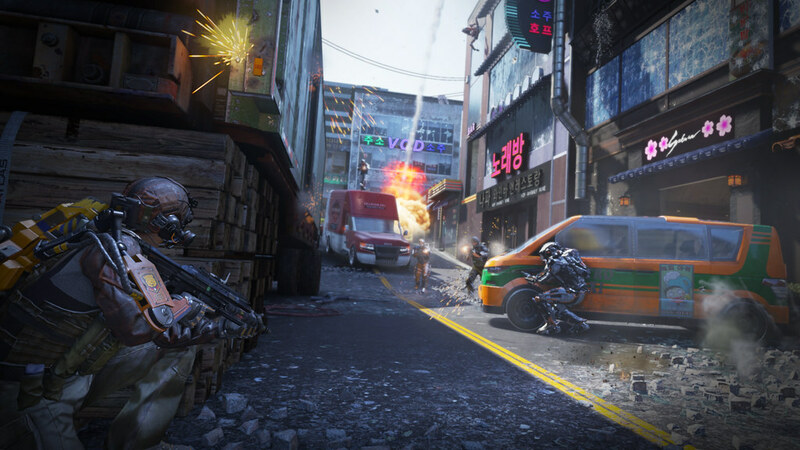 Screenshots from Call of Duty: Advanced Warfare Reckoning below.